In a thrilling round 6, the leaders of both championships lost their games, opening up the race for 1st completely. 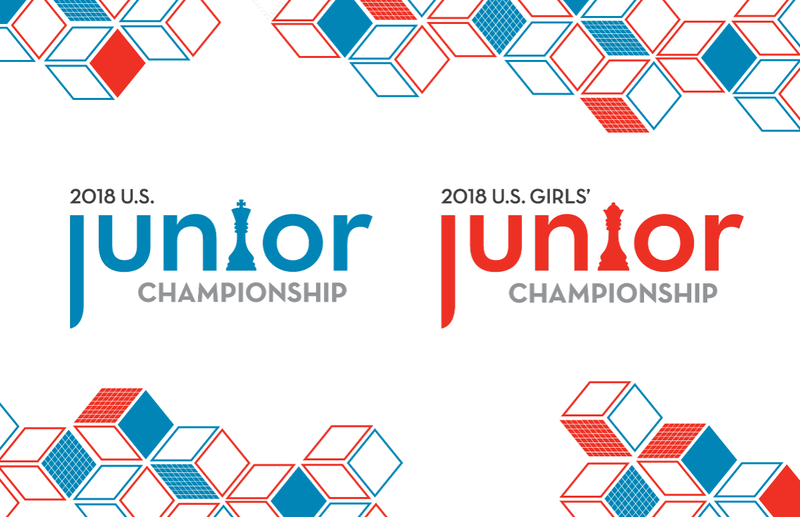 The Junior section currently has a 6-way tie at the top while Carissa Yip’s lead has been reduced to just half a point in the Girls’ section. 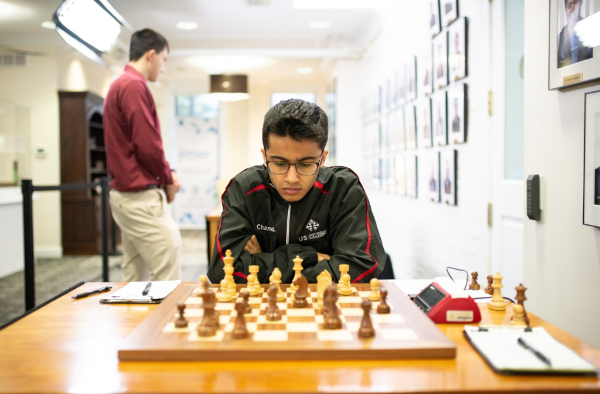 The game of the day was Akshat Chandra’s victory over tournament leader, Advait Patel. Chandra essayed a kingside pawn storm in a King’s Indian Defense, doubling his queen and rook on the h-file to exert pressure. On move 34, Chandra found an elegant shot, Nxd6!, breaking through in the center, and soon checkmated. This victory gave Chandra a share in the colossal tie for 1st. 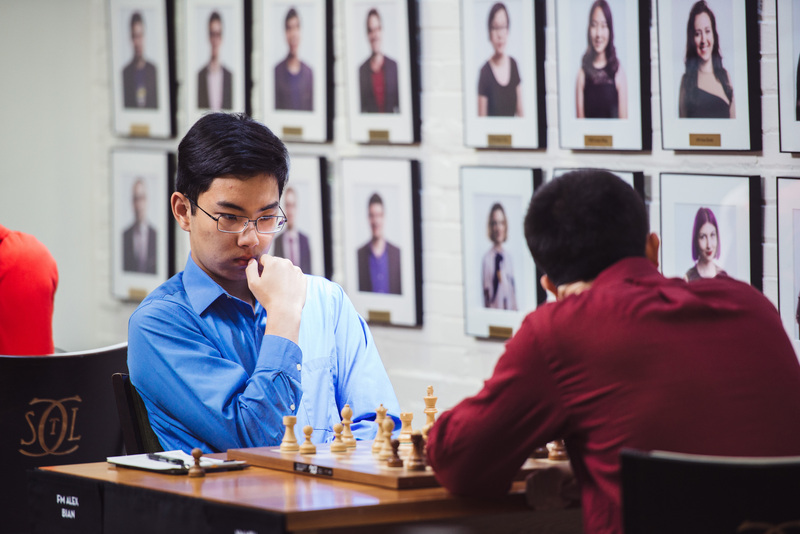 Alex Bian vs. Mika Brattain featured a double-edged kings-castled-on-opposite-sides middlegame. In the midst of complications, the two players obtained an imbalance of a rook vs. a bishop and two pawns. Initially, Brattain’s bishop and pawns had the advantage. However, in the ending, Bian was able to utilize his rooks and create a dangerous passed d-pawn, leading to a breakthrough and victory. In a Classical French Defense, Praveen Balakrishnan outplayed Annie Wang, leaving her with a cramped position and blocked light-squared bishop. 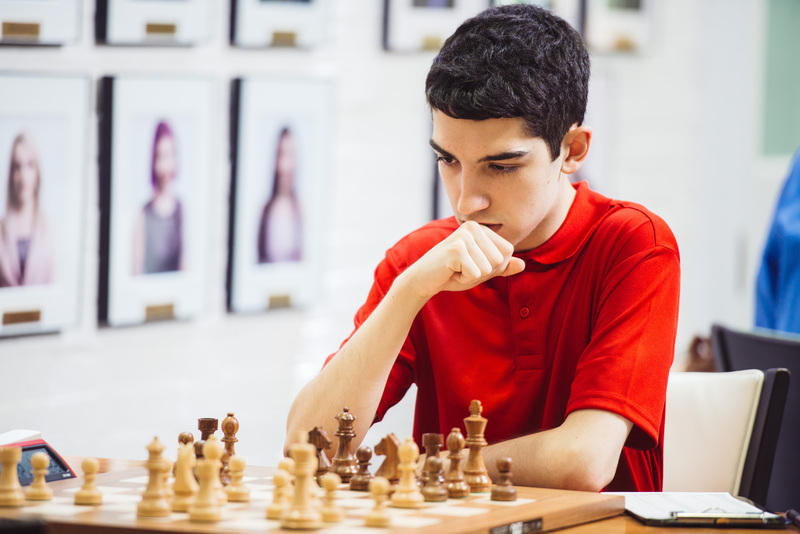 In the endgame, Balakrishnan gradually nursed these advantages into a winning two pawn advantage. Andrew Tang vs. John Burke was an even battle for a long time until Tang blundered a piece on move 41, just after making time control. Ruifeng Li vs. Awonder Liang was a very even game in the Caro-Kann throughout, ending in a 57 move draw. The finish of this round leaves six(!) players tied for 1st—Awonder Liang, John Burke, Akshat Chandra, Advait Patel, Praveen Balakrishnan, and Alex Bian. There are three games left, and it is nearly anyone’s tournament! The game of the day was Sophie Morris-Suzuki’s upset victory over Carissa Yip. It is not everyday that you see the player at the bottom of the scoreboard defeat the person at the top! On move 33, Morris-Suzuki found a key tactic, striking in the center of the board with ...Rxd4! 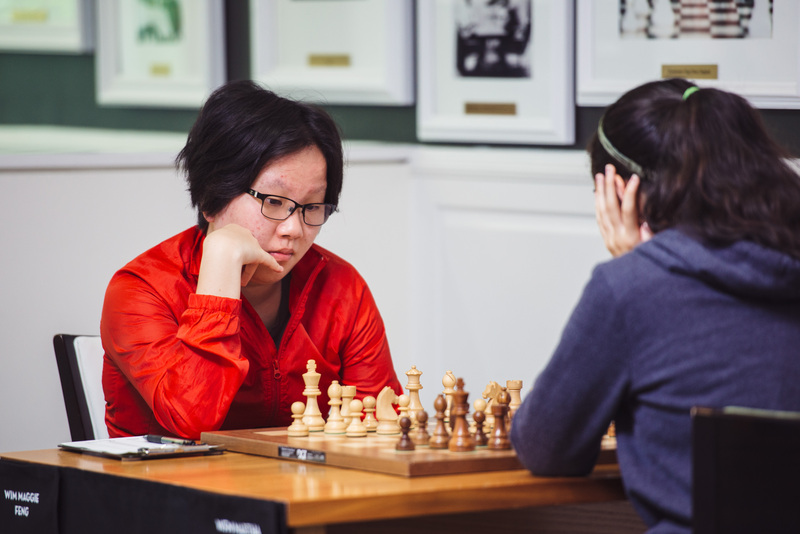 Although Morris-Suzuki gave Yip some chances to get back into the game in the resulting time scramble, after time control, Morris-Suzuki’s pieces took over the board, and she soon won material and the game. Jennifer Yu also bounced back today with a dazzling attacking victory over Nastassja Matus. Matus ran her king into the center when Yu broke through on the kingside, but this wasn’t enough for her king to escape alive. Yu cracked through in the center with 28. Rxe6+!, and it was all over. 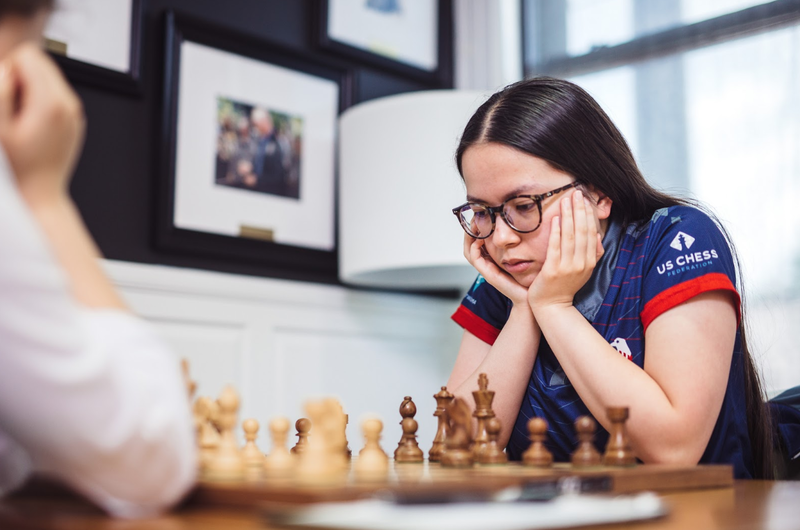 Rochelle Wu’s victory vs. Thalia Cervantes featured 18 moves of opening preparation before the youngest player in the tournament had to think of her own move. With extra space and more active pieces, Wu had a significant positional advantage. She converted these into an attack against Cervantes’ open king, gaining a huge amount of material in the process. 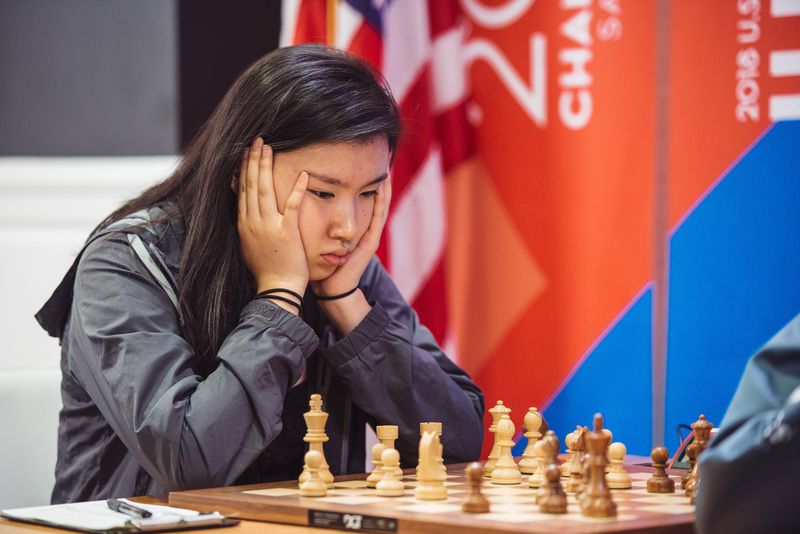 Emily Nguyen gained a critical opening advantage when she achieved an octopus knight on d3, taking away Sanjana Vittal’s ability to castle and winning a pawn. Nguyen gradually pressed her advantage in material and activity to victory. The only draw of the round was Maggie Feng vs. Martha Samadashvili, which was a fairly level conflict from start to finish. Carissa Yip still leads, but Maggie Feng, Jennifer Yu, and Emily Nguyen are close behind with 4 points.